It's time for another great evening! 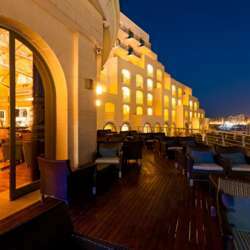 Quarterdeck Bar of Hilton Malta - one of the most luxurious and exclusive hotels of Malta! Let's Mingle in Hilton Quarterdeck Bar! The venue has been booked exclusively for the InterNations members! Quarterdeck Bar is located in Hilton Malta (Portomaso area-St.Julians). A welcome drink will be offered to each attendee. With classic sophistication, its distinctive nautical theme and dark leather furniture, the chic Quarterdeck Bar at the Hilton Malta hotel exudes charm and elegance. With its own identity, stylish interiors and large terrace overlooking the award-winning Portomaso Yacht Marina, the Quarterdeck is the place to be. Patrons are invited to choose from a large selection of fine champagnes and innovative cocktails, or browse through the extensive International wine list, all of which perfectly complement the delicious selection of platters and Tapas menus. Whether you’re relaxing after a meeting or getting together with friends for special drinks, the intimate and timeless surroundings, coupled with the bartender’s knowledge, make the Quarterdeck Bar an ideal location. Choose from an array of fine champagnes, innovative cocktails, or from the vast international Wine List, which is aimed at complementing the delicious selection of platters, cheeses and gourmet bar treats. Kindly confirm your presence by clicking the 'Attend' button. Please feel free to bring your friends along but please invite them to sign up for InterNations first, to help grow our Malta Community! Let's have an unforgettable Pre-Easter Party in one of the most cosmopolitan hotels of Malta! I am looking forward to meeting ALL of you!